Another quality eBook from Chapel Library. This issue of the Free Grace Broadcaster includes 8 articles on the subject of Contentment. What Is Contentment? by William S. Plumer (1802-1880): an introduction and discussion. The Quiet of the Heart, by Jeremiah Burroughs (1599-1647): the peace contentment brings to the heart and things that ruin it. Contentment: A Rare Grace, by J. C. Ryle (1816-1900): the command to "be content." Consideration: A Great Help to Contentment, Thomas Jacombe (1622-1687): think seriously about God’s gracious providences. Full Contentment in Christ, by Jonathan Edwards (1703-1758): the soul of every human being craves happiness, only found in Christ. The Hellish Sin of Discontent, by Thomas Boston (1676-1732): the evil of discontentment. I Will Never Leave Thee, by A. W. Pink (1886-1952): God’s promise never to leave His children. My Times in God’s Hand, by Octavius Winslow (1808-1878): our loving heavenly Father rules over every event in our lives. Finally I get this ebook, thanks for all these Free Grace Broadcaster - Issue 213 - Contentment I can get now! Free Grace Broadcaster - Issue 213 - Contentment was the best books I ever buy. Free Grace Broadcaster - Issue 213 - Contentment did exactly what you said it does. I will recommend you to my colleagues. 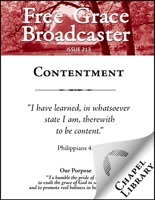 Free Grace Broadcaster - Issue 213 - Contentment is the most valuable books we have EVER purchased. I'd be lost without this. I am completely blown away.